Anyone who has been following the Akshay Kumar on social media would know that he is a self-confessed fitness enthusiast and his posts are often related to fitness. On Wednesday, Akshay Kumar shared a video of himself cycling "no-handed" through the "deserted roads" of Jaisalmer. The 51-year-old actor accompanied the post along with a caption which read: "Feeling free like you couldn't believe! Working my core as I cycle no-handed on the deserted roads of Jaisalmer. Life is about balance and stability, as functional as this may be, please don't try this on the road." Within few hours Akshay Kumar's Instagram video has garnered over 1,427,608 views. The video has also been liked by Sonakshi Sinha and Shahid Kapoor. We chanced up on a comment by actor Ayushmann Khurrana, who wrote: "What an inspiration! Sir you look 25 in this one," and we can't agree more. 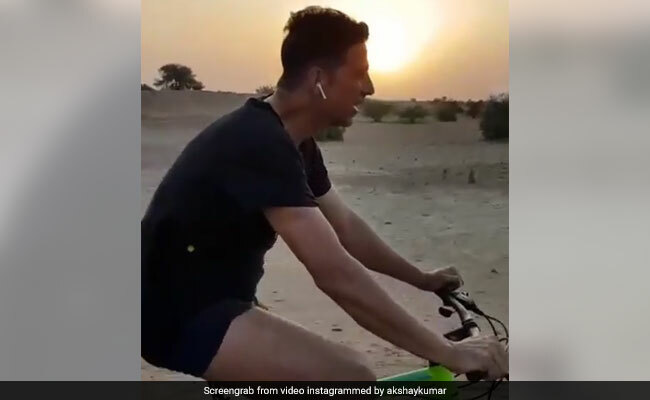 Akshay Kumar, who is in Jaisalmer shooting for Housefull 4, shared a video of himself exercising outdoors recently. "Always been a fan of mornings even more beautiful here in Jaisalmer. Doing a neck exercise today and I personally love exercising outdoors as it helps boost the body, mind and mood. What about you guys," the actor captioned the video. The Gold actor follows a strict fitness regime and keeps no stone unturned to encourage his fans to lead a healthy life. The actor has been actively endorsing the Fit India movement, a campaign initiated by Prime Minister Narendra Modi. Akshay Kumar was last seen in Reema Kagti-directed Gold. The actor will next be seen in 2.0, co-starring Rajinikanth, which is scheduled to release on November 29. Akshay Kumar also has Good News and Kesari in the line-up.